Although art appreciation, or even collection, may seem like a daunting concept for the average college student, it is actually quite an enjoyable experience. Have you ever wanted to look at some amazing art, but found it wasn’t accessible? Galleries are not always the most welcoming environments, with snobby shop assistants or outrageous price ranges that no one younger than their mid-thirties can afford. But, the college student is in luck, because there are also places like The Cotton Candy Machine in Brooklyn—a gallery that accommodates all wallet sizes and has a wonderful staff very eager to be of service. The shop, located on 1st Street, has a very fresh and modern feel, and caters to a younger audience, so if you’re looking for something to do on a Saturday afternoon, or you just want to see some cool drawings, toys, paintings, wood carvings etc., this is the place for you. The bright blue benches outside will draw you in and the art will make you stay. They break out some crazy and innovative artists that have a lot to say even on small surfaces. In fact, the shop is well known for its quaint sized drawings and paintings. The Cotton Candy Machine (even the name sounds cool and inviting!) was co-founded by an artist herself, Tara McPherson, who makes extremely colorful, detailed paintings that can be bought for as little as $20 as a lithograph. She sells her art in many other forms, including shirts and tank tops. 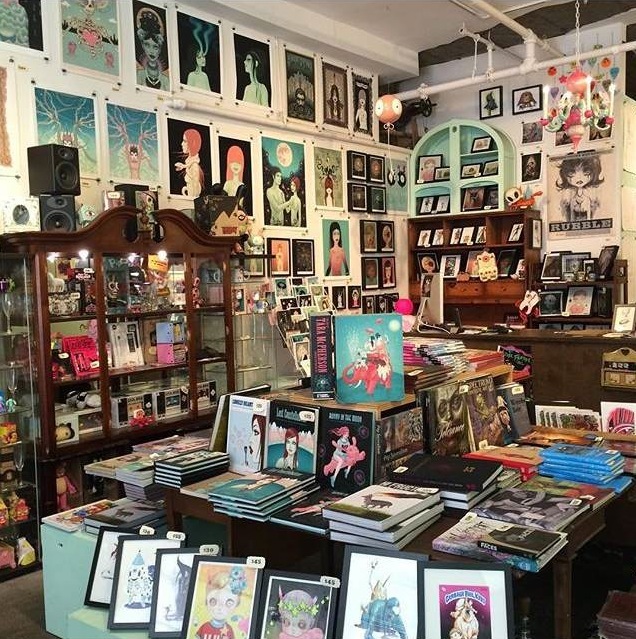 The shop also has featured artists hanging on the walls, a toy, sticker, and button collection by the register, and a center table dedicated to art books and magazines. 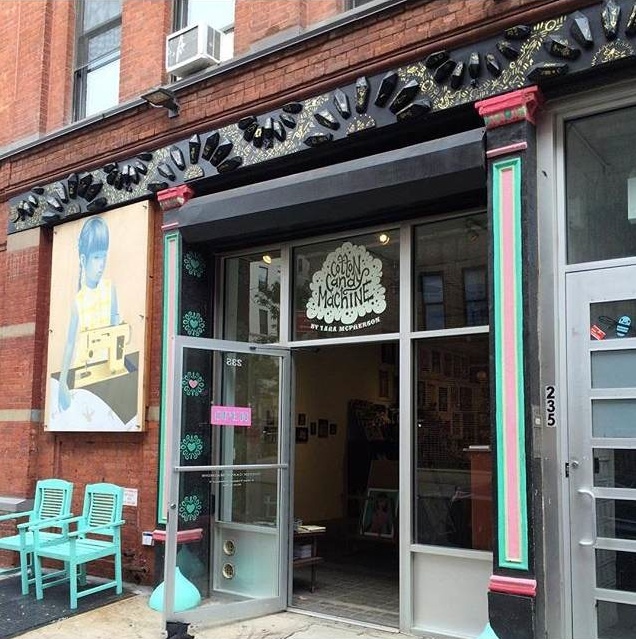 Did I mention that this art gallery happens to be a convenient 15-minute walk from Smorgasburg’s Williamsburg location (open Saturdays from 11am-6pm until November 21st) where you can pick up unique foods from over 100 different local food vendors? 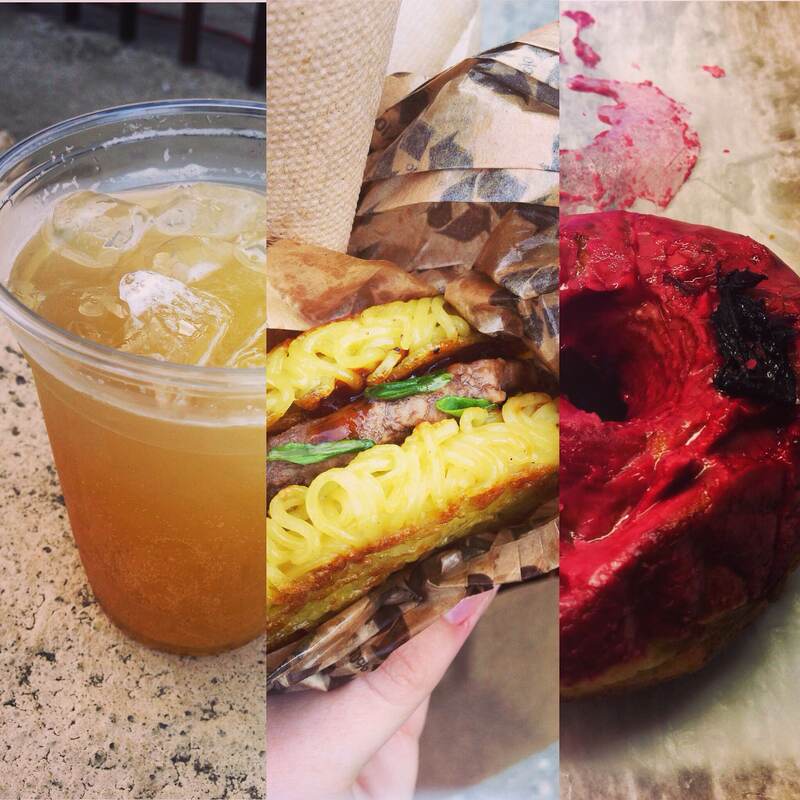 I seriously recommend the Pineapple Black Pepper Ginger Soda (all natural) from Bolivian Llama Party, the Ramen Burger, and a Hibiscus doughnut from Dough. There are also tons of other unique places in the area that deserved to be checked out, like Artists and Fleas, a handcrafted art and vintage market. Brooklyn doesn’t just have an amazing writing atmosphere, but appreciates all forms of art, handcrafting, and individuality. I highly recommend checking out all the above-mentioned places for a great afternoon that won’t disappoint! The credit for the first and third photographs of this blog post goes to IG @thecottoncandymachine!